With an eye toward empowering and inspiring kids, Chelsea Clinton explores some of the biggest challenges facing our world today. Using data, charts and stories she unpacks challenges related to Poverty, Climate Change, Gender Equality, Health, Endangered Species and talks about what's being done to make a difference in each area--particularly by kids and teenagers. 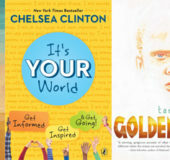 With lots of suggestions and ideas for action, Chelsea Clinton shares her passion for helping others and shows readers that the world belongs to every single one of us, and every one of us counts--no matter how young. Contains new material from the author! What’s the first thing you remember reading? The first thing I remember reading on my own was the local newspaper, the old-fashioned kind that left ink stains on my hands. I probably read Corduroy or a Curious George story first, out loud to my parents, but it’s the newspapers I pored over as I ate my morning Cheerios that mark the line in my mind between not-reading and reading. The newspaper is probably what I remember most because it’s what enabled me to be a part of my parents’ conversations about what was happening in our hometown of Little Rock, Arkansas, and the broader world. Those conversations happened around the dinner table every night and intensely after church on Sunday over lunch. They happened on the way to school and on the way home from ballet class, before Brownies meetings and after softball games. In other words, they happened all the time. Knowing what was in the newspaper meant I didn’t have to wait for my parents to explain everything to me. I could ask questions to start conversations about the world too. Best of all? The newspaper helped hide how much honey I poured on top of my Cheerios. My mom wouldn’t let me have sugary cereal growing up (more on that later) and so I improvised, adding far more honey than likely would have been in any honeyed cereals. Thankfully, my mom never caught on. I was very fortunate growing up. My main worries were things like trying to get my mom to relax her ban on sugary cereals, figuring out how to stick a clay honeycomb or papier-mâché Jupiter or clay-and-Popsicle-stick coral reef to poster board for various science projects, how to sell more Girl Scout Cookies than I did the year before and whether my best friend Elizabeth and I would sleep at her house or my house Saturday night. I never doubted I would have a roof over my head, a school to go to, enough to eat, books (and newspapers) to read, a safe neighborhood to play in and a doctor to see if I got sick. My parents and grandparents made sure I knew I was lucky. I don’t remember a time not knowing the life story of my mom’s mom, my grandma Dorothy. By the time she was eight, my grandma Dorothy’s parents had abandoned her twice, often leaving her hungry and alone in their Chicago apartment. The first time was when she was three years old. Ultimately, they sent her to live with her grandparents in California. When she became a teenager, her grandparents told her she was no longer welcome in their home and that since she was old enough to get a job and support herself, she had to leave. If she hadn’t found a job working in someone else’s home, she would have been homeless. If her employers hadn’t supported her determination to go to school, she would have had to drop out. As a teenager, she constantly worried about whether she would have a roof over her head, be able to go to school or have enough to eat. My grandma Dorothy as a kid in 1928. My grandmother always talked very matter-of-factly about her memories of being hungry and scared as a child. Knowing her story helped me be aware that some of the kids I knew at Forest Park Elementary, Booker Arts Magnet School or Horace Mann Junior High likely had to worry about whether there would be enough to eat that day and whether it would be safe to play outside when they got home. Less than twenty-five years before I was born, Horace Mann was a school only for African American students. Back then, schools were segregated by race in Arkansas—as they were across much of the South until the late 1950s—and the schools white kids went to had more and better resources, like nicer classrooms, more books, newer desks and fancier playgrounds. The wounding legacy of segregation and growing up knowing adults who had worked for civil rights and equal opportunities for African Americans was part of what made me understand that many kids in my community and around the world were still treated differently because of the color of their skin. My mother’s work on behalf of girls and women first in Arkansas and later around the world helped me understand how being born a girl is often seen as reason enough to deny someone the right to go to school or to make her own decisions, even about who or when to marry. This is a photocopy of the letter I sent to President Reagan in 1985. I included one of my favorite stickers as a sign of respect (and hoped it might help the president take my letter more seriously). Reading the newspaper and knowing what was happening was only a first step—making a positive difference, or at least trying to, was what mattered most. Those expectations were one of the greatest gifts my parents and grandparents gave me. It felt important, and exciting, to know I could make a difference, or, again, that at least I could try. I wrote a letter to President Reagan when I was five to voice my opposition to his visit to the Bitburg cemetery in Germany, because Nazis were buried there. I didn’t think an American president should honor a group of soldiers that included Nazis. President Reagan still went, but at least I had tried in my own small way. In elementary school, I was part of a group that helped start a paper-recycling program. Through my church in Little Rock, I volunteered in park cleanups, helped with food drives and worked in soup kitchens. There was always more to do, but seeing bags fill up with trash, barrels fill up with canned food and people eating meals all taught me that a group of people working together could have a real impact—and that such work could even be fun. Supported by my grandparents, while in elementary school, I joined organizations like Greenpeace, the World Wildlife Fund and Conservation International because I believed in their work and wanted to be part of it, even if it was being done far from Arkansas. All were dedicated to protecting our environment and protecting animals—whales, elephants, giant pandas—that I had seen only in our local zoo or on television but felt a connection to. I wanted to play even a minor part in ensuring their futures. I talked about issues I cared about to anyone who would listen and hoped I wasn’t too annoying, because if I wasn’t annoying, and I was making a good argument, then maybe one more person would care about whales or elephants or giant pandas than before I’d started. What I didn’t realize when I was younger was how much of what I read, thought about, debated and tried to make a difference on were issues that arguably had even more of an impact on kids my age than on grown-ups. That’s still true. Some things, like certain infectious diseases, are more dangerous for kids, while other things, like global warming, affect kids more because you will live with the consequences for longer (unless we stop climate change). A good part of what I worry about now, I first started worrying about when I was a kid. This is a book about some of the big issues our world and particularly kids face. It’s also a book about some of the solutions young people (and a few adults) have created and supported to help make their families, neighborhoods, cities and our world healthier, safer and more equal. This book is not exhaustive, meaning it does not address every single issue around the world today. Far from it. It also does not come close to tackling every detail of the issues I do talk about. In the same way, the solutions I describe represent only a small part of what has been tried and what has worked, for example to help people be healthier or to get more kids in school. Throughout, it draws on facts and research. Hopefully the data makes the issues more interesting—and feel as urgent to you as they do to me. I hope the little history I include has a similar effect. Understanding why a problem exists and whether it recently has gotten better or worse is important in figuring out the best solution. This book is not political, in the sense that it does not take a political position, or tell people to vote a certain way. It does recognize how the people who get elected and hold office in the U.S. and around the world influence the issues we most care about. The issues I talk about in this book are all connected. A family living in poverty is more likely to confront hunger than one living comfortably. One type of inequality that girls face around the world is being denied the right to go to school, and so there are more girls, particularly older girls, than boys not in school. Patterns of infectious disease are changing as the climate changes and the earth grows warmer. And those are just a few examples. Not surprisingly then, solutions are also often connected. Having equal numbers of girls and boys in school sends a powerful message to those students and to younger kids that all people have an equal right to an education and an equal right to their own dreams. Halting climate change so that we have more stable weather removes some uncertainty around the next disease outbreak; that means health systems, hospitals, clinics, doctors, nurses and others can be better prepared to save more lives. And, again, those are only a couple such examples. Throughout this book, you’ll meet amazing young people (and a few older ones)—some of whom I’m lucky enough to call my friends, and many I’ve never met—who are working on solutions to individual issues and at these very intersections. I admire all of their work and, if nothing else, I hope their stories are as inspiring to you as they are to me. I’m excited that you’ve agreed to come on this journey—after all, it’s your world! When I was fifteen, I was lucky enough to travel with my mother to South Asia. We visited Pakistan, India, Bangladesh, Nepal and Sri Lanka. I remember being so excited. I couldn’t wait to see the majestic Taj Mahal in Agra, India, the beautiful citadel of the Lahore Fort in Lahore, Pakistan, and the almost mythical Boudhanath Stupa in Kathmandu, Nepal. I hoped to see elephants in Sri Lanka, and I couldn’t wait to share it all with my mom. Throughout the trip, I learned, saw and experienced even more than I’d imagined possible. My mom and I at the Taj Mahal in Agra, India, in 1995. Our first stop was Pakistan, where we visited schools and mosques, centuries-old temples, bustling markets and parks. What I remember most are the people we saw and met, including then–prime minister of Pakistan Benazir Bhutto, the first woman prime minister or president I’d ever met. But the people who made the greatest impression on me were girls my own age and even younger who I saw working in fields and on streets, and those I talked to as we walked around their school or shared a soda. What struck me most from our conversations was how much we had in common and how our most enthusiastic smile-inducing moments involved talking about our favorite subjects in school, our favorite books and what we wanted to be when we grew up. I wanted to be a doctor, or at least do something related to health when I was older. Different girls I met at the girls’ school we visited in Islamabad shared their dreams too. One wanted to be prime minister like Benazir Bhutto, another a doctor, one a teacher and one girl I will never forget told me she wanted to climb all the tallest mountains in the Himalayas in each country—Pakistan, India, Nepal, China and Bhutan—to conquer the mountains and to help build relationships across countries and cultures. I was in awe of her, but I was equally in awe of the girls I met who were determined to succeed, particularly those from poor communities in Pakistan and elsewhere on our trip where most kids, especially girls, didn’t even go to school at the time. They were determined that the hardships that too often come with poverty—widespread disease, fewer opportunities to go to school, hard work for little pay or no work at all—were not going to be the beginning and end of their stories. The second country we visited was India. In Ahmedabad, as we drove, we saw what seemed an endless patchwork of tin, tarp and what looked like giant garbage bags serving as roofs for thousands of homes built of metal, wood and mud. It was the first slum I’d ever seen that stretched over a horizon, and it was an overwhelming sight. It was heartbreaking to think about people who would lead their whole lives entrenched there. When we were in Mumbai, we saw the Dharavi slum, one of the largest in the world, where it’s estimated 1 million people live. As we left India, I knew I would never forget the soaring splendor of the Taj Mahal, the serenity of Gandhi’s ashram (more on that in a bit), the beautiful traditional dancing I’d seen—or the slums. This is what the Dharavi slums look like from the sky. In Dhaka, the capital of Bangladesh (a country the size of Wisconsin with more than 100 million people then, and even more today), the slum and city seemed even more intertwined; we could see a slum not far from our hotel room’s window. Seeing the slums, whether from a road or a room, and walking through different ones in different cities, it was hard to fathom that the people living there were only miles (sometimes less—only across the street) from clean water, flushing toilets, health care, schools, roads and electricity. It felt like another world—but it wasn’t. The main difference? Poverty. Sharing a soda in Pakistan with some girls around my age. What do you think is a good definition of poverty? Many different definitions exist. Poverty can be calculated based on how much money someone has, how much money someone makes or how much property and how many things someone owns or can buy with the money they have. Sometimes the definition of poverty is based on the answers to certain questions like: Is someone homeless or hungry? Do they have clean or safe water for drinking, washing and cooking? Can their kids go to school? The World Bank, an international organization that gives loans to the world’s poorest countries to help fight poverty, defines poverty according to the average amount a person lives on per day, or the average money a person spends each day. It’s the most common definition and so it’s the one we’ll use. When someone is living in poverty, it’s harder to get a good education, have enough to eat, find clean drinking water or stay healthy, which makes it harder to find and keep a good job. And all of those things make it harder to escape poverty. The challenges are all connected, so the solutions have to be too. I hope that’s something that will be clear by the time you finish this book. If you are drawn to the issue of poverty and how it impacts people around the world, you’ll need to decide which definition makes the most sense to you and is most useful in thinking about which part of the poverty challenge you want to tackle and help solve. This chapter focuses on the poorest people in the world, many of whom live in what’s known as the developing world, a group of countries stretching across the globe, with average per capita incomes below a certain level. (The average per capita income is the number you get when you take how much money a whole country makes and divide it by how many people live there). I don’t love the term “developing world.” It seems to imply (even though I know it’s not meant to) that people who live in relatively poorer countries are somehow less developed as thinkers, dreamers and doers. It also seems to discount the important contributions people from the so-called developing world have made to science, medicine, economics, literature, art and other fields. And it’s a very wide category, grouping together, for example, India and Liberia, despite their different histories and geographies, not to mention populations or average per capita incomes. India has more than 285 times as many people as Liberia! And, in 2014, India’s average per capita income was more than $5,000. In Liberia, it was less than $900. That’s a big difference. And there’s still a big difference if we look at another measure, the median per capita income. (The median per capita income is the midpoint in a country’s per capita income, meaning half the population makes more money and half makes less.) It’s an important measure because when calculating an average, a few very wealthy people can move an average up, making it look like a whole country has gotten wealthier when it’s really just a few people. The median per capita income is a lot lower in both India and Liberia, but India’s is still more than five times higher. India’s median per capita income is $616. Liberia’s is $118. So, while “developing world” may be a very wide category, it’s the term still most commonly used to describe countries in which people on average are not yet as well off as people in the so-called developed world, including the United States (U.S.), Canada, parts of Asia and the Middle East and much of Europe. Because of that, I’ll use it . . . but not happily. Meanwhile, I hope someone comes up with a more respectful term soon (maybe you!). Also, too often in the news, in movies and television shows, poverty is equated with Africa. There is poverty in Africa, which is a huge continent made up of fifty-four different countries, but there are people struggling against poverty in every country on earth. Poverty is everywhere. So too is growth. In 2012, seven out of the ten fastest-growing economies in the world were African countries. HOW IS POVERTY MEASURED AROUND THE WORLD? The World Bank defines people living on $1.25 a day or less as living in extreme poverty. You might be thinking $1.25 probably buys a lot more in Papua New Guinea or Ghana or Guatemala than in the U.S., and you’d be right—but the World Bank takes that into account. People living on $1.25 a day spend that much (or less) to survive on what $1.25 a day would buy in the U.S. Nowhere on earth is $1.25 a day enough to cover all costs related to housing, food, clean water, transportation, improved sanitation (systems to separate poop and water), education, health care and other things people need to live a decent, safe life. Just to put that in perspective, $1.25 is about how much it costs to buy a package of trail mix in a vending machine—not enough to live on, anywhere. Extreme poverty may also be called absolute poverty—whatever it’s called, it’s the reality for many people across the world. In 2011, just over 1 billion people across the world lived on less than $1.25 a day—most on a lot less than $1.25. The average income among the world’s poorest 1 billion people is an astonishingly low seventy-eight cents a day. Sometimes people living on less than $1.25 a day are referred to as the “bottom billion,” because they make so much less money than people at the top of the economic ladder or pyramid (pick your favorite shape). This is another image I don’t like, as it seems to suggest that poor people are somehow less than or below everyone else. The money you have—or don’t have—says nothing about your character, your dreams or who you are. But it’s a term you might read in news stories or hear in conversations about people living in absolute poverty, and one you may end up feeling comfortable using given what a powerful image it is. And even though just over 1 billion people on the planet are living on less than $1.25 a day, another billion are living on less than $2 a day. That’s less than the cost of a box of Kraft Macaroni & Cheese (my favorite food when I was your age). Many economists argue that, as is true for $1.25 a day, nowhere on earth is $2 a day sufficient for someone to afford the basic necessities and lead a safe, healthy and long life. Some developing countries, notably China, have had more success than others in reducing extreme poverty over my lifetime (though no developing country, including China, has eradicated it). In Burundi, the Democratic Republic of Congo, Liberia and Madagascar, four out of every five people live in extreme poverty. Think about that as you look around at your neighborhood. Imagine what life would be like if almost everyone around you was hungry, thirsty and had little reason to hope tomorrow would be better than today. That’s life for people living in places where almost everyone is very poor, whether that’s your country, your city or your neighborhood. And it’s not just life for adults. Children are even more likely to live in absolute poverty. Around the world, about 400 million children live on less than $1.25 a day. That means almost one out of every five children on earth lives in absolute poverty. Although more children are surviving into adulthood than ever before, for many children in the developing world, absolute poverty can be a death sentence. In sub-Saharan Africa—the three-quarters of the African continent mainly or entirely below the Sahara Desert (or Africa minus Egypt, Libya, Tunisia, Algeria and Morocco)—more than one in ten babies born do not live to see their fifth birthday in the poorest countries. Every country can do better, and in general the world has made tremendous progress in helping children lead healthy lives. But in far too many places, being very poor can mean an early death. One of the places we visited on our trip to South Asia was Mahatma Gandhi’s ashram in Ahmedabad, where Gandhi lived and worked for more than a decade while he led India’s struggle for independence from the United Kingdom (U.K.). His nonviolent approach to resistance was crucial in helping his country finally gain independence in 1947 and influenced peaceful protesters throughout the world—including America’s Dr. Martin Luther King, Jr. When we toured the ashram, it looked much as it had when Gandhi left it in 1930, pledging not to return until after independence (which tragically never happened, as Gandhi was assassinated after India gained independence but before he could return). My mom and I walked through sparsely decorated rooms and it was easy to imagine Gandhi sitting there with his spinning wheel, inspiring young men and women to join in India’s march toward independence. Here my mom and I are learning about Gandhi’s work at his ashram. As was also true in Gandhi’s time, the ashram is much more than a physical space. It continues Gandhi’s work in educating and empowering Indians, including through teaching women skills they can use to earn a living to support themselves and their families. One of the women we met at the ashram gave me the most beautiful handmade paper. She shared her story of being able to support herself and her family because of the ashram’s skills training and their help in selling her paper. She didn’t look that much older than I was, and she already had children. She also had confidence that her children would have a better life than she did, in large part because of the income she earned from selling her paper at the ashram and elsewhere. I had read Freedom at Midnight, a history of Indian independence, before the trip and I remember thinking that the woman’s craft and confidence were both a fitting legacy for Gandhi. Think about that woman making paper in India but with a few crucial differences—she lives in a rural village, hasn’t received any job training and she doesn’t have a safe place where her paper is sold at a fair price. So she’s on her own. Making paper uses a lot of water, and women living in Africa and Asia have to travel on average 3.7 miles to get water for drinking, cooking and cleaning (and for making paper). Too often, that water’s not safe or clean, so she or her kids might get sick drinking it, and even die. But let’s assume the water is safe to drink—that doesn’t mean, however, that getting to the water is safe or that getting her finished paper to the closest market is safe. In many places, it’s not safe for a woman to walk alone anywhere. So she waits until someone can travel with her, or faces a very real risk of being attacked or even killed. Or she could pay someone to get water for her or take her paper to market for her. No good choices—waiting means losing possible business because it takes longer to make paper and get it to market, paying someone to get water or take her paper to market means losing a portion of hard-earned income and being attacked is just plain horrifying. But let’s assume she makes it safely home with water, makes her paper and then makes it safely to market, all without having to pay someone else to take her paper there for her. The closest market is probably full of people like her who live in extreme poverty and cannot afford to spend much on paper, even beautiful paper. If she could get to a market farther away, where people with more money to spend go shopping, she could charge more for her paper. But that’s unlikely. So even if she works hard, makes wonderful paper, avoids getting sick or attacked and sells her paper, she may only earn just enough to help send her kids to school (if there is a school—more on this challenge in Time for School). It will be very hard for her to make enough money to never have to worry about her kids’ schooling, let alone clean water, good food, reliable shelter or safety. While this picture is a little different in a city—markets filled with all different kinds of people are likely easier to get to, so she may earn more money over time—it’s not likely she’ll earn enough to remove all worries about food, water, safety or school. It’s very hard to be very poor—and to get out of poverty—anywhere. Poverty resembles an endless loop, where the causes bleed into the effects and go around and around . . . and around. This is what is known as the cycle of poverty. Think of our paper maker—it’s unlikely the water she uses is clean, so it’s likely her kids regularly get sick from dirty water. Taking care of her sick kids prevents her from being able to work more, make more paper and then sell more to earn more money to lift her family out of poverty. Understandably, economists and other people who study extreme poverty have a hard time separating out causes and effects. Like our paper maker, most people living in extreme poverty do not have access to clean water. More than three out of four people living in extreme poverty live in rural farming areas, farther from better-paying jobs and markets where people with more money shop and farther from schools to learn new skills (or even learn to read). More than half do not have access to electricity. Are people caught in extreme poverty because they’re sick a lot due to dirty water (and other things)? Or because they don’t have access to the greater educational and job opportunities that often come with living in a city or a wealthier country? Or are they often sick because they’re so poor? These questions are thought-provoking, but I hope you won’t let them distract you from the ultimate goal: to help people live to their fullest potential everywhere in the world. We know that to help people—and countries—get out and stay out of poverty, more needs to be invested in cleaner water, quality schools, quality health care, better roads, improved sanitation and so, so, so much more. For many wealthier countries, those investments came at least in part from the government over decades, even centuries. Most poor countries haven’t had the resources to make similar investments (or haven’t had the leaders who’ve made doing so a priority). While that’s starting to change, it’s not surprising that poorer countries are more likely to have people living in extreme poverty than wealthier countries. What can you do? We’ll get to that soon. While it’s hard to separate out poverty’s causes and effects, it’s fair to wonder why some countries—and people in those countries—are poorer than others. Why is the per capita annual income just above $600 in the Central African Republic and more than 100 times that amount in Singapore and Norway? Or more than eighty-five times that amount in the U.S.? There are many complex reasons. Those discussed below are just a few highly generalized ones. Most historians, economists and social scientists—academics who study people and societies over time—agree that geography matters. Places that have more extreme climates and more extreme weather events—like hurricanes or droughts—are more likely to have more people living in extreme poverty. This is partly because extreme climates, particularly very hot, dry places, and places with frequent extreme weather events, like hurricanes, make it harder to grow crops. They get washed away if there’s too much water one year, and too much salt water from storms can change what, if anything, farmers can grow. All of that makes it more difficult for families and communities to have a reliable source of healthy, nutritious food, which is particularly important for kids. Worldwide, an estimated 165 million children under five are malnourished and suffer from stunting, meaning their bodies and brains are not developing at a normal, healthy rate because they don’t get enough food and enough of the right kinds of food to eat. Their physical and intellectual growth is stunted because of a lack of the vitamins, minerals and nutrients every child needs to grow and develop (think of all the things you see listed on a cereal box, like Vitamin A, Vitamin D, calcium—many kids don’t get any of those, much less all of them, in the amounts they need). Poverty and stunting are deeply intertwined. Parents living in extreme poverty are more likely to have children who suffer from stunting. Children who are stunted generally grow up less physically and mentally strong, less able to learn and succeed in school (if they’re in school) and less able to work as productively as people who were not malnourished as young children. Adults who were stunted as children are more likely to be poor later in life. Notice how similar this map is to the earlier one of the developing world. It’s also arguably another depiction of the cycle of poverty. A country’s economy is the sum total of all activity that involves money and resources. This includes what individuals and companies make, what consumers buy and what people are paid. A strong economy depends on the strength of all these parts. The more money people earn from what they make or do, the more they can later spend. If someone has more money to spend at the market on her neighbor’s paper, that neighbor will then have more money to buy food. The farmer whose food she buys will have more money to invest in seeds for next year’s crops and to send her children to school and so on. If an economy has a lot more stunted workers, or workers held back by illness (that they may have gotten from dirty water) or illiteracy (because they likely never went to or stayed in school for long), none of that can happen on a large scale. Countries with fewer educated and healthy workers and fewer healthy kids in school are less likely to see their economies grow and poverty shrink. It’s also hard for a country’s economy to grow if it’s persistently battling extreme weather or earthquakes, and not just because of the effects on crops. Imagine if you lived in a place where hurricanes, floods or landslides occurred regularly, washing out roads and bridges, wrecking your home, your school and where your parents work and knocking out power lines (though there probably isn’t power—more on that below). You’d miss days of school waiting for the damage to be repaired. Your parents would miss days of work, needing to restore your home and waiting for the roads to be fixed so they could get back to work. It’s hard to build for tomorrow if you constantly have to repair damage from yesterday. My family has a few ties to Heifer. In the last few years of her life, my grandmother Dorothy gave Heifer animals to all of her grandchildren for Christmas. Well, not the actual animals, but a certificate saying our grandmother had given animals to families in need in our names. Although I wondered why I always seemed to get a buffalo (and my cousins goats), I thought the life-giving gifts were the perfect Christmas presents. My mom wrote the foreword to a wonderful book called Beatrice’s Goat, which tells the story of Beatrice from Uganda. Heifer gave a goat to Beatrice’s family that Beatrice helped take care of. After less than three months of selling the goat’s milk, Beatrice’s family had saved enough money to send Beatrice to school (before, they couldn’t afford the school fees, a challenge we’ll talk more about in Time for School). Beatrice graduating from the Clinton School of Public Service. Beatrice worked hard and did well in school, and as a result, received a scholarship to go to college in the U.S. She went on to graduate school at the University of Arkansas Clinton School of Public Service (started by my dad). And Heifer is based in Little Rock, right across from the Clinton Presidential Library. I am proud my dad’s library is Heifer’s neighbor. There are lots of ways for kids and families to participate in Heifer’s work, including by giving a goat to a family like Beatrice’s. For $10 or $20, you can help send a goat, cow or flock of chicks to a family like Beatrice’s. Another way to participate is through Heifer’s Read to Feed program. You find a sponsor for yourself or your class who pledges a set amount of money for each book you read in a defined period of time (you can even do it by chapter or page if you want). However many books you’ve read at the end gets multiplied by the amount pledged and then donated to Heifer to support their work. For more on Heifer, including Read to Feed, visit heifer.org. Water is another important element in understanding why extreme poverty exists in some places and not others. Of course, water is essential to life—for drinking, cooking, cleaning and bathing—but it’s also vital to economies, because waterways, like rivers, seas and oceans, are used to transport products and workers. Rivers and ocean ports that are part of important trading routes are more likely to be centers of business and will have more jobs for people with different talents, skills and levels of education. It’s not an accident that some of the biggest and most prosperous cities in the world—from London to Los Angeles—are around rivers or on the ocean. It’s also not an accident that most of the biggest economies on earth—the U.S., China, Japan, Germany and the U.K. are the top five—have significant coastlines (or are surrounded by water). Countries without easy access to an ocean are known as “landlocked,” and it’s more expensive for those countries to sell or buy goods (because they have to travel longer to or from the ocean, and those travel costs get built into the price people have to pay). Many of the poorest countries are landlocked. But while places with easy water access tend to be less poor on average, it’s no guarantee that poverty isn’t sometimes near the water. The slum I mentioned in Ahmedabad? It’s on a river. So are parts of the Dharavi slum and many slums and poor villages around the world. Here’s a picture of a kid who is using a well drilled by Living Water International, which is committed to bringing wells closer to people who need them. It’s not only proximity to water for ports that’s important. As previously mentioned, people in the developing world (usually women and girls) often have to walk far to get water. That time getting water is time not spent in school, not working in a job and not building a business. And parents (generally moms) spend days taking care of children who are sick from dirty water, days they’re not working and their kids aren’t in school. All of that means lost income for families and lost economic growth for countries, which means not getting out of poverty. We’ll talk more about how diseases and poverty are connected in a bit. One way you can help kids keep healthy and stay in school, plus help more women have time to work and earn money (both important to helping families escape poverty), is by supporting efforts to drill and maintain water wells and other water systems. Clean water flows underground all over the planet—but it often takes real work to reach even the closest underground water. People have been using wells for thousands of years, and in many places (including some in the U.S.) wells are the easiest, most reliable and safest way to access clean water. Different types of wells are best suited to different environments and it’s not safe to dig a well just anywhere. Matti and her friend Sam preparing for their Walk for Water. Three organizations working in partnership with local communities across the world to build, finance and drill better, safer and just plain more wells and water systems are Living Water International, charity: water and Water.org. You can support any of their work through walk-a-thons, bake sales or any creative way you can think of to raise money. In 2013, then ten-year-old Matti, along with friends and family, organized a 3.7-mile fund-raising walk in her hometown of St. Joseph, Missouri, after she learned that was the average distance women, and children traveling with them, in Africa and Asia walk to get to water. Matti wanted to help Living Water International, an organization she first learned about through her church, in its work to build more wells so women didn’t have to walk so far. Initially hoping to raise $100, Matti and her group raised $5,600, enough to cover the cost of drilling one new well for a community. To learn more about Living Water International, charity: water and Water.org, and what you can do to help build a well like Matti did, you can check out their websites: water.cc; charitywater.org; and Water.org. Another common challenge confronting poor people in poor countries is a lack of electricity, what’s known as energy poverty. Across the developing world, more than 1 billion people lack access to electricity and another 1 billion lack access to reliable electricity (meaning they might have it sometimes, but likely not often). Across Africa alone, nearly 600 million people lack access to reliable electricity and power. That means no light after dark to read or study by, no refrigerator to keep food cool and fresh, no electric or gas stoves to cook on. There are no computers to turn on, phones to charge or TVs to watch. Imagine what your life would be like at home or at school if you didn’t have power, if you couldn’t do anything after dark except sleep or talk to your family. If you couldn’t go outside at night because you couldn’t see . . . anything. Safe, reliable energy is essential for escaping poverty, because it means kids will be able to spend more time in school (not just when it’s bright and sunny) and study at home, women will be able to spend less time preparing food (cooking is easier and food can be kept in refrigerators instead of made fresh each day) and adults will be able to work more hours (again, not just when it’s bright and sunny) and so much more. Snapshot of the earth at night showing where there’s electricity and where there’s not. Getting energy and electricity to everyone is a logistics challenge (how to do it) and a cost challenge (is it affordable). But there’s another challenge too—getting more people energy and electricity quickly and cheaply may mean electricity is generated in a way that adds more pollution to the environment. And not just a little more pollution, but a lot more. While we don’t want that, we do want everyone everywhere to have the same chance we do in the U.S. to learn, study, work and play—and that requires electricity. It’s important that the world’s leaders in government and business find the right balance to empower people today—literally with more power and electricity—and protect people tomorrow from the pollution that still too often comes with more power and electricity. This is something currently being discussed in global conversations on climate change. Let’s hope world leaders find the right answers to help people in poverty today get electricity and to help everyone tomorrow not be burdened with even more pollution to clean up. We’ll talk more about the relationship between energy and pollution later in the book. While world leaders debate what the right solution is to energy poverty, we can support organizations and people who are solving their own energy challenges. Barefoot College teaches illiterate and semiliterate women how to make, install, use and care for household solar units. These help convert sunlight into electricity without adding pollution to the environment. Barefoot’s main students? Grandmothers (just like you’re never too young to make a difference, you’re also never too old)! They’re known as Solar Mamas and they generally work in teams of two. Every pair of grandmothers Barefoot College trains helps electrify up to 150 homes in their local village, bringing light to an average of 800 people. Solar Mamas help maintain the solar units forever, which is great for the people who get electricity and for the grandmother who has a real (and very cool) job. A Barefoot College Solar Mama working on a solar panel. Inspired by Gandhi and started by Bunker Roy, Barefoot College and its grandmother alums have helped more than 500,000 people in India and around the world access electricity—without adding tons of pollution to the atmosphere. That’s amazing. Bunker is one of the happiest and most inspiring people I’ve ever met. I like to think that if my grandmothers had lived in the communities where Barefoot College works, they would have been among Bunker’s grandma graduates! To learn more about the work Barefoot College does and what you can do to help, please visit barefootcollege.org. When someone is sick a lot or is constantly worried about getting sick, everything is harder. A sick person generally can’t work as hard in a job or in school as someone who is healthy, or they might not even be able to get a job or go to school because they’re sick. There’s also a hopelessness about the future that constant illness can bring, a sense that it’s not worth getting an education or a job—in other words, investing in the future—because death is just around the corner. More diseases live in warmer places than colder places, for all sorts of reasons. As just one example, mosquitoes that carry malaria can’t survive in colder climates, so neither can malaria, a disease that infected almost 200 million people in 2013 alone. Malaria is expensive—very expensive—for families, communities and countries. If adults are sick, they’re at home, not working and not contributing to the country’s economy. If kids are home sick with malaria, they’re not in school learning what they need to know to later get a good job and contribute to their country’s economy in the future. Academics have shown that, quite simply, more malaria means less growth for a country. Less growth year after year leads to a much smaller economy over the longer term. In other words, a poor country with malaria is likely to remain a poor country with malaria until malaria is defeated. Partly because of the relationship between hotter places and more disease, where countries are on the globe and where people live has a lot to do with whether or not extreme poverty is the norm or the exception. Sadly, malaria is only one example of what diseases can do to an economy and a country. We’ll meet some other examples of diseases that are dangerous to both people and economies later in the book, and hear about what’s being done to make them history. We’ll talk about malaria more in Bugs and Bacteria. Many of today’s poorest countries were colonized, or forcibly taken over, by foreign powers and only became independent from their colonizers sometime after World War II (like India did in 1947). Particularly those in Africa were ravaged by the slave trade; from the 16th–19th centuries, people were snatched and shipped off to be slaves in places like Brazil and the United States rather than building healthy productive lives in the places they were born. The history of a country’s neighbors matters too. Countries surrounded by other countries with similar stories of colonization are more likely to be poor. The opposite is also true—countries surrounded by neighbors that were never colonized are less likely to be poor. And back to food. Economists have found a relationship between longer histories of more formal farming (think of rows and rows of wheat or peas and irrigation) and wealth today. In other words, more rows of wheat for a longer time mean a country’s more likely today to be relatively better off. And by a longer time, I mean a really long time. People living in the Middle East began more formal farming as long as 11,000 years ago, and in Europe about 8,500 years ago. In sub-Saharan Africa, formal farming began “only” around 2,000 years ago. Ancient and more recent history aren’t the only things that matter, but both influence how wealthy or poor countries are in the 21st century—the 2000s. Bad and good neighbors alike matter for more than just their history. Countries surrounded by relatively peaceful and stable neighbors are more likely to be peaceful and stable. Can you imagine what your neighborhood would feel like if all of your neighbors were always fighting with each other? If fighting could break out at any time and overrun your home, your school, your streets, where you shop, where you eat, where you play? Instability and insecurity often spread like viruses. Countries surrounded by unstable, insecure or violent neighbors are more likely to have to deal with spillover violence. Wars that start in one country can also affect another country even if the violence itself isn’t infectious. Countries trying to avoid getting drawn into violent conflict have to spend more resources—money, time and effort—on their own defense (militaries) than on their schools, factories or science labs—which would help their economies grow and people move out of poverty. Refugees fleeing violence at home and seeking a safer haven in another country often need things like food, shelter, clean water and clothes (all of which cost money) provided by their host country before international help arrives (and often even after it does). Countries with violent or unstable neighbors end up spending a lot of resources responding to one crisis after another and trying to stop the violence from spilling into their own land, instead of planning and investing in a better future with more opportunities for their people. During my trip to South Asia with my mom, one of the stops we made was in the state of Gujarat in India to visit with women who were involved in an organization called the Self-Employed Women’s Association (SEWA). Created by Indian activist Ela Bhatt, SEWA helps poor women get the skills, support and money they need to sustain and grow their own businesses. One of the unique things about SEWA is that it brings together Muslim and Hindu women in a part of the world where fighting between people from different religious backgrounds has cost countless lives, both between countries and within India. Today, SEWA has more than 1.9 million members. I remember arriving at a large tent and sitting down in the audience, surrounded by hundreds of women, all of us listening as SEWA women shared their stories with my mom. They spoke about their individual experiences and their collective story through SEWA. Women from all different backgrounds told us how they’d learned how much more they had in common than they’d first thought because of their different religions. Their support for each other gave them the confidence to stand up to bullying and harassment, and the relationships they’d built helped prevent violence between Hindus and Muslims, because they saw each other as friends and real people, not only as representatives of different religions. The SEWA women also found they could earn more money when their communities weren’t fighting with one another and when they worked together. I felt deeply honored and more than a little overwhelmed when I was introduced to the audience as “a potential future member of SEWA.” If you’re inspired by SEWA’s story and want to get involved, you can learn more at sewa.org. Learning more about SEWA from one of the women I met in Gujarat, India. The women of SEWA learned to trust each other with their lives and their families’ futures—the SEWA program helped them pool their savings and lend that money to other women who needed it to invest in their businesses, their kids’ educations and more. If you think that sounds like a bank, you’re right, SEWA is a bank too. SEWA borrowers repaid almost 100 percent of their loans (96 percent to be exact!) and the women who pooled their savings knew they could take their money back if they needed it. Now imagine if you didn’t know if you could open a bank account or if after you’d opened a bank account and made a deposit, you didn’t know whether your money would be there when you needed it or even just the next time you went to the bank. Imagine you didn’t know whether or not the money you earned or invested today would be worth 100 or 1,000 times less in a year (because of something called inflation, where money can lose value quickly if people lose trust in a country). Imagine you bought a piece of land to farm or to open a business on and you didn’t know whether or not you would own that land—or the business—in a year because a government official could take your property and you couldn’t do anything about it (because the police and courts weren’t honest). Imagine if to avoid that fate, you had to pay a big bribe to the same government official threatening to take your property away, trading your hard-earned money just to keep your business going. You wouldn’t want to participate in corruption, but to not pay the bribe would mean all your hard work would be for nothing. Imagine you didn’t know if the president in office today would still hold office tomorrow or have been forcibly removed from power (what’s called a military coup). Imagine if you read the newspaper or listened to the radio and you couldn’t trust what you were hearing—not because of a difference of opinions, but because the facts themselves were literally made up to serve the purpose of whoever owned the newspaper (often the government), not the public. This roller coaster of uncertainty is what people face in many countries around the world. Why is it important to trust in the reliability of what we participate in—whether putting money in a bank, running a business or voting? If people can’t rely on their money having consistent value and being in the bank when they want to make a withdrawal, or if people are worried their country may tip into civil war at any point, there’s arguably little reason for working hard today. The thinking goes, why bother, if it could all be gone tomorrow? If people aren’t working hard and coming up with new ideas, investing in and expanding croplands and businesses, economies don’t grow. But if people know that their governments aren’t going to topple, that their governments aren’t corrupt, that bribes aren’t necessary to do business, that banks are going to be around tomorrow, that their money won’t be worthless and that everyone is treated fairly and equally by the legal system (the police and courts), economies are more likely to grow and more people likely to move out of poverty. The different experiences of South Korea, a well-functioning democracy, and North Korea, a brutal dictatorship, demonstrate this contrast, as seen in the chart. Being near the bottom of Transparency International’s corruption index means that in North Korea, bribes to officials, whether in the government, the army or otherwise, are a common, even expected, part of doing business. Those who do have access to the Internet in North Korea often work for the government (and seem to spend a lot of time targeting the United States and U.S.-based businesses). In South Korea, the more than 90 percent of people who have access to the Internet also enjoy the fastest average Internet connection speeds in the world. In recent decades, hunger and famine have repeatedly struck North Korea but not South Korea. Before World War II and the Korean War, which effectively ended in 1953, Korea was one very poor country. The main differences since then? The types of systems—political, legal, business, education—that each built over time and what each invested in (or didn’t). After the Korean War, South Korea’s government invested in building water, sanitation, electricity, education, transportation and health care systems and watched its economy expand and most South Koreans move well out of extreme poverty. North Korea didn’t make any of those investments in a serious way that would benefit most North Koreans. Where would you rather live? It’s not a hard question to answer when it’s between North and South Korea. Sometimes, it’s a less obvious answer, particularly when we think of beautiful places blessed with diamonds, oil or other precious natural resources. You may have heard of what’s often referred to as the “resource curse” or “resource trap.” Some of the poorest countries on earth have precious stones like diamonds and emeralds, rare metals like gold and silver, energy sources like oil or natural gas and other minerals you may not have heard of but that play an important role in our lives, like bauxite, which is used to make aluminum for soda cans, tinfoil, utensils and parts of airplanes. In many countries with these extraordinary natural resources, a few people have gotten very rich, while many people have stayed very poor and thousands—in some places millions—have died in the fighting over resource wealth. The tens of thousands who died and millions who became refugees after the Sierra Leone civil war of 1991–2002, a war largely over diamonds, is a tragically perfect example of the resource curse. To be clear, resource wealth doesn’t always lead to civil war and chaos. Botswana has diamonds. Lots and lots of diamonds. For decades, Botswana’s leaders have invested much of the money made from diamond sales in building roads, bringing electricity to more people and improving education at all levels, in other words, investments to help an economy grow and people move out of poverty. From independence in 1966 through the 1990s, Botswana’s economy grew faster than any other in the developing world, even South Korea’s. Making smart investments was only part of the story. Botswana also established clear property rights (so that everybody knows what they own and what they don’t own), the rule of law (creating a police force and court system that treats people fairly at least much of the time), a commitment to transparency (about where the diamond wealth was being invested) and a democratic election system (though one party has dominated). Who governs and how they lead—called governance—matters, particularly when thinking about addressing complex challenges like poverty. Botswana still struggles with extreme poverty and inequality. Too many people in Botswana still live on less than $1.25 a day, while some people have gotten very rich off diamonds—but it’s much better off than it would have been if its leaders had kept all the diamond wealth for themselves.